Fire extinguishers are an important part of any home or business emergency prevention plan, however, there are some important things to consider when it comes time to buy them. Buying an extinguisher for a home is going to be much different than purchasing extinguishers for a factory. Consider the specific needs of your space before making a purchase. This is especially important for businesses. There are many instances where the all-purpose ABC fire extinguisher will not meet NFPA standards, depending on the materials you work with and the size of your space. Ask a certified fire inspector what is required for your facility before making a purchase. Though it may be tempting to buy a larger fire extinguisher than is required, consider who will be using it. If you are buying for the home, purchase a smaller extinguisher that is easy to lift, carry, and store in a closet or cabinet. If it is going to be placed in a vehicle bracket, make sure the extinguisher will fit the bracket properly before purchasing. If customers or employees should be able to access and use it when needed, the recommended size will be easier for most people to handle. 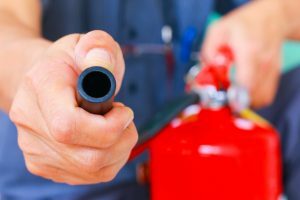 Though it may be less expensive initially to buy extinguishers at a hardware store, keep in mind that if they are being used for a business, they will still require an inspection—even if they are brand new. Purchasing your fire extinguishers from your local fire protection company will save time and money, as the extinguishers will already be inspected, tagged, and ready to pass any fire marshal inspection. Often the extinguisher alone is not the only thing your business needs. Many properties also need vehicle brackets, extinguisher cabinets, stickers that indicate the location of exits and emergency equipment, or wall brackets to mount the extinguishers. Trying to find all of these things separately can be a hassle. Your local fire protection company can help you learn exactly what you need and offer it all at one location, so you will be prepared for emergencies or your fire marshal inspection. Equally as important as purchasing fire extinguishers is training your family and employees so they know how to use them. When reviewing fire safety, remember the PASS method: Pull the pin, Aim at the base of the fire, Squeeze the handle slowly, Sweep the hose or nozzle from side to side. Some fire stations offer training events for their communities, or you can call your local fire protection company to set up a fire training class for your office or employees. Remember, planning ahead for emergencies is the best way to prevent them from happening. If you have any questions, feel free to reach out to us, we are proud to protect our communities and are always here to help.